A flight at Thresher’s Brewing Company in Searsmont. PORTLAND, Maine — As more than 90 breweries have piled into Maine’s growing craft beer scene, Maine-based brewers are slowly but surely racking up an increasing share of the in-state beer market. Maine brewers have steadily increased their share of total beer sales since 2012, accounting for about 12.1 percent of all beer sold in Maine last year, according to state data. That’s up from 8.6 percent in 2012. However, giant Anheuser Busch InBev still made up about half of beer sold in Maine last year. That share was down from 53 percent in 2012. Maine’s growth is in line with national trends, where craft beer’s market share doubled to about 12 percent in 2016, up from around 6 percent in 2012, according to the Brewers Association, a national craft beer trade group. In real, drinkable terms, Maine breweries together sold about 44 percent more beer last year than in 2012, putting out almost 1.2 million gallons more. The Bangor-based Geaghan Brothers nearly doubled production in 2016, after expanding to Brewer. The increase comes as tastes in beer are changing and the brewing business blossoms at all different scales, with some producers looking to distribute regionally and others taking a hyper-local focus. Almost all of the state’s small brewers distribute most of their beer in Maine, according to a recent report commissioned by the Maine Brewers’ Guild. Tourism may also play a role in the rise of in-state sales. The data show beer sales spike during summer and the density of brewing operations has grown enough to support ancillary businesses, such as shuttles that will take beer tourists from one spot to the next. At the same time, that means more opportunity here for craft brews from away, too. California’s Stone Brewing, Utah’s Uinta Brewing and New Hampshire’s Moat Mountain Brewing grew their distribution in the state rapidly from 2012 to 2016. That growth came as giant Anheuser Busch InBev saw declining volumes in Maine and Miller Coors’ distribution held steady. Still, those giants are picking up their share of the market, too, by buying up craft breweries. Anheuser Busch InBev has bought breweries like New York’s Blue Point and Washington’s Elysian Brewing Co., among others. Heineken in 2015 bought the California-based Lagunitas, which was the fastest growing out-of-state brewery in Maine from 2012 to 2015. Last year, it sold about as much beer to Mainers as did the Rhode Island-based Narragansett or the Lyman-based Funky Bow Brewing. Maine brewers are expanding their footprint on the national scene. While Maine is the key or only market for many breweries, the industry as a whole sold about 60 percent of its volume of beer in other states, according to state figures. That’s increased as more breweries enter the scene, some dependent entirely on sales within Maine. The data don’t allow precise measurement of how much beer each brewery sells in-state and out-of-state, mostly because of something called contract brewing. If a brewery doesn’t have enough capacity, it can contract with another brewery to make its beer. In that arrangement, the beer production gets reported at the place where it was made, not by the brewery whose name ultimately goes on the can or bottle or keg. That changed a little in 2015, with the passage of a state law that allowed another type of arrangement, tenant brewing, to expand. In that situation, a tenant brewer uses another company’s equipment, but logs the production under their own name. All of those dynamics are at play in the state data’s presentation of brewery output. Shipyard, the state’s largest brewery, shows a decline in total output from 2015 to 2016, but contract brewing and tenant brewing affects that number. Any beer produced by a tenant brewer on Shipyard equipment, in 2016, would not get reported as Shipyard beer. The numbers in Maine reflect national trends, as the number of small craft breweries continues to balloon while taking up a relatively small, but growing, share of the market. 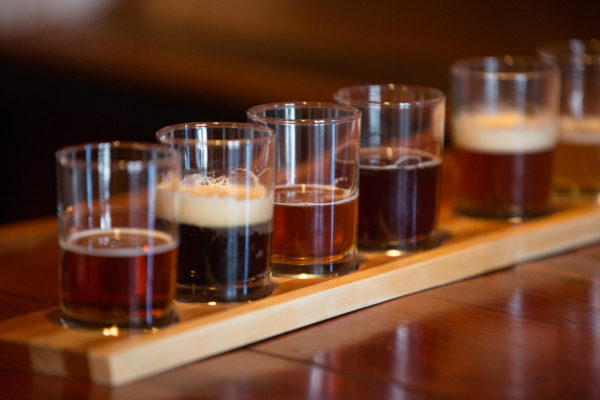 With the release in March of national craft brewing statistics, the chief economist for the Brewers Association, Bart Watson, said the field is growing increasingly crowded. “Small and independent brewers are operating in a new brewing reality still filled with opportunity, but within a much more competitive landscape,” Watson said. And the industry has relied on its newest entrants to help stimulate overall growth, driving down the average size of breweries. And while booming business here, Maine’s breweries are just a drop in the overall craft beer bucket. Maine’s brewery output in 2016 was about 1.2 percent of all craft beer production nationwide.